I had heard about Sauce on one of the food blogs I read. My first thought about it was “If it’s truly an Italian restaurant, why isn’t it called ‘Gravy’?” Once I got to Sauce and tried their menu, I understood exactly why it wasn’t called Gravy. Sauce, in fact, isn’t very Italian at all. Located on Rivington and Allen, Sauce has a fairly hip location, and its interior clearly reaches for that certain, exclusive feeling. Dim rooms with tiny wooden tables and chairs situated too close together fill the joint. MDP asked, “Why’d they give us this table?” which was located just steps away from the restrooms and kitchen (which, reflecting upon the layout, probably shouldn’t be so close together). “I don’t know,” I replied. “But it’s better than that one.” I gestured to a lone table in the midst of several other tables that would have been impossible to maneuver behind. If you look online at Sauce’s website, their menu is basically illegible. It’s impossible to know what description goes with what dish and so on. At the restaurant itself, the menu is much more clear. We were presented a thick list of specials–which seems odd to me. Why not put more on the regular menu instead of having so many specials each night? I digress–and selected the avocado salad off that menu for our appetizer. Initially, I had thought that we would get their garlic bread, sold by the piece (another oddity), but they fed us delicate slices of bread and vegetables soaked in olive oil when we sat down. 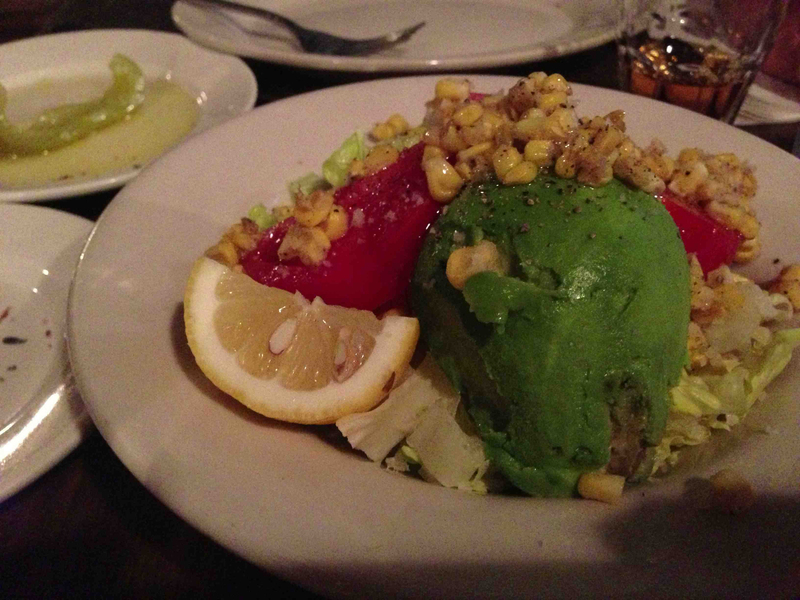 The avocado salad was a bowl filled with chopped iceberg lettuce with a can of corn kernels and slices of tomato dropped on top, and one half of an avocado carelessly placed on one side of the dish. I enjoyed the salad, although I wish they had included more avocado. A light, barely perceptible vinaigrette coated the salad mixings. I was so hungry at the time that I wolfed down my portion of the salad in no time. 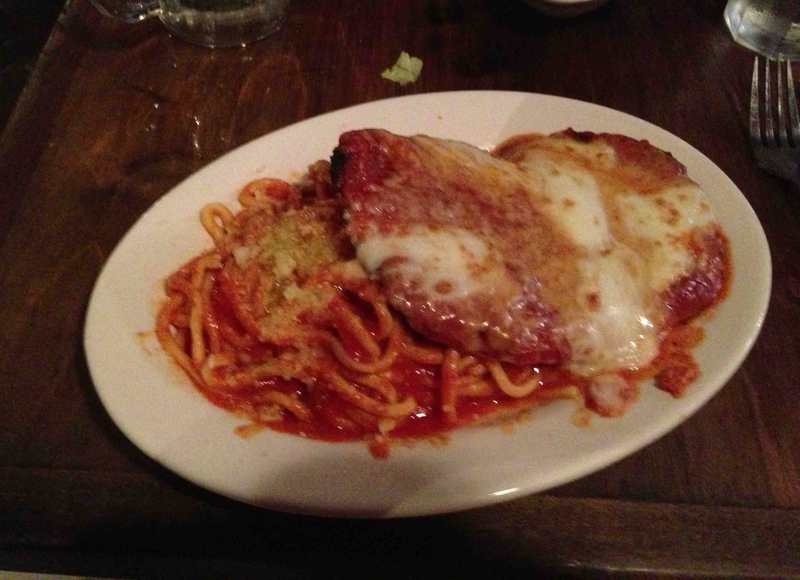 For my entree, I opted for the chicken parmigiana because, I figured, even non-Italian restaurants can get that right. MDP got the gnocchi alla sorrentina, which is just gnocchi with melted mozzarella on top. My chicken parmigiana was fine. The chicken itself was tender and easy to cut through, but they put way too much of their eponymous sauce on the chicken and not enough mozzarella. The ratio was off. In addition, they offered me a side of homemade spaghetti, which was voluminous and dense, with ample amounts of their sauce on top–but no spoon to eat it with. Also, there wasn’t any parmesan cheese on the table for my dish. They just put some on top of the spaghetti at their own discretion. These hints clued me into the fact that Sauce is not entirely authentic. MDP’s gnocchi came out in a very tiny dish. They were spinach gnocchi and he commented that they were just okay. He didn’t like the sauce either. I wouldn’t recommend Sauce. As I said, any Italian restaurant that even hints at the stuff that you put on spaghetti should be called Gravy. That’s the Italian way. You know I don’t like Italian restaurants (because I find I can make the dishes better at home), so take my review for what it’s worth. Maybe Sauce doesn’t want to be authentic, who knows. All I know is that I’m not going back there. Take the F/M to Delancey/Essex, walk up to Rivington then left.